Iryna Varabei is a member of Toronto Guild of Stitchery and she was featured in an April blog post. She has been very busy since then so here is an update! It was very nice to meet Iryna in person during Seminar. She had a lovely, colourful display and was selling her patterns at the Thursday evening Merchant's Mall. As the crowds lessened later in the evening, I was able to talk with her a bit. 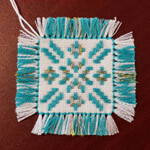 She told me that she has been doing some teaching in her guild and is always happy to share her interpretation of Belarusan stitching techniques with people who are interested in this two-sided form of embroidery. 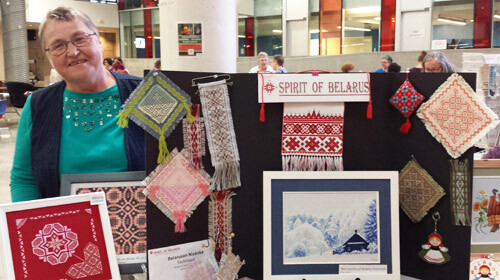 Iryna submitted an entry to "Let Your Creativity Out," EAC's annual challenge, and received an honourable mention. If you were at the Members' Exhibit, you probably saw one of Iryna's pieces. 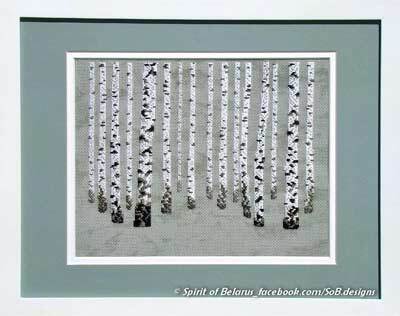 She entered "The Lure of Birchwoods," a striking canvas work piece. 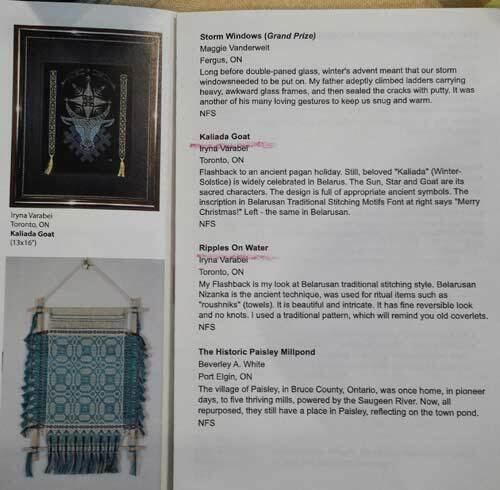 It was very nice to hear that Iryna had two submissions accepted into the national Threadworks 2016 Flashback show. Information about the upcoming exhibitions will be available on the Threadworks website. 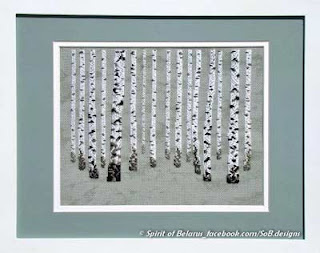 Find out more about Iryna's work on her website, her Facebook page or her Craftsy page.